The coalition represents a breakthrough repositioning of New York labor to combat climate change. With its launch, Climate Jobs NY will build a broad, inclusive, dynamic and powerful campaign with unions, environmental, climate justice and community organizations for climate and economic justice. Climate Jobs NY is advocating for New York State to continue to lead the nation on combating climate change by implementing an ambitious 10-point climate jobs program. The coalition’s policy agenda will dramatically reduce greenhouse gas emissions and reverse inequality through major investments in renewable power, transit, and building energy efficiency. Investments will create good union jobs, more equitable communities, and a more resilient New York. Climate Jobs NY applauds Governor Cuomo’s recent commitment to partner and announce new renewable energy and building efficiency initiatives that will help create 40,000 good jobs by 2020. The new initiatives include solicitations for as much as $1.5 billion in large-scale renewable projects, the first in a series that will develop 40 to 60 of these projects over the next few years, capable of powering 320,000 homes. Others include an expansion of energy efficiency and solar in public buildings, and a commitment to studying the feasibility of the types of economic efficiencies that can be achieved through the use of a Project Labor Agreement. The announcement represents a transformative direct link made between climate policy and efforts to address economic inequality. 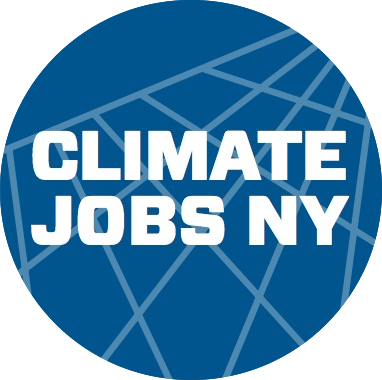 Climate Jobs NY looks forward to ongoing work with the Governor to advance similar initiatives in the energy, transport, and buildings sectors to promote a “climate jobs” program for New York State. The Climate Jobs NY campaign can trace its spark to a three- year initiative convened by The Worker Institute at Cornell University’s ILR School, called Labor Leading on Climate. In the aftermath of the devastation caused by Hurricanes Irene and Sandy, The Worker Institute convened unions to open a dialogue over solutions to the climate crisis that could simultaneously support good jobs, worker protections and economic justice. The Worker Institute’s newly released report, “Reversing Inequality, Combatting Climate Change: A Climate Jobs Program for New York State,” builds off of the three-year initiative and is co-authored by J. Mijin Cha, Assistant Professor at Occidental College and Lara Skinner, Associate Director at the Worker Institute at Cornell University’s ILR School. The report, “Reversing Inequality, Combatting Climate Change: A Climate Jobs Program for New York State,” can be found at http://bit.ly/2sjUJGR. Gary LaBarbera, President, Greater New York Building Construction Trades Council, said "On behalf of 100,000 union building trades members, I commend Governor Cuomo for his leadership to address climate change while also supporting the working men and women of New York. This announcement demonstrates the Governor's commitment to good jobs in a growing sector of the economy." Mario Cilento, President of the New York State AFL-CIO, said "We welcome this partnership with Governor Cuomo to strengthen the economy, while addressing climate change. Expanding the state's commitment to renewable energy projects is not only an opportunity to make New York a leader in the clean energy industry, it's an investment in long term, sustainable middle class jobs in our state. Good paying jobs with benefits allow working men and women to provide for their families while supporting local businesses in their community." "This initiative would help create good jobs while protecting and improving our environment," said Vincent Alvarez, President of the New York City Central Labor Council, AFL-CIO. "I commend Governor Cuomo on helping to make this groundbreaking partnership a reality." John Samuelsen, International President, Transport Workers Union of America, said "Today's announcement represents New York seizing the opportunity and responsibility to address the growing crisis of climate change in a way that creates good jobs and begins to reverse inequality. On behalf of our 140,000 members, we commend Governor Cuomo as he shows the nation how to lead the fight on climate and jobs." Climate Jobs NY is a growing coalition of labor unions united to combat climate change and reverse inequality. CJNY educates fellow workers, builds alliances, and advocates for policy solutions that demonstrate we do not have to choose between a healthy planet and good jobs.